Children choose cereal based on the latest television advertisement or the cute yet useless toy that comes in the box. As a parent, you want them to eat a cereal that offers vitamins and minerals and sends them off on their day feeling full. Finding a cereal that satisfies both parent and child can be difficult, but several cereals for kids do offer high fiber, essential nutrients and good taste. Dietary fiber describes the portion of a plant-based food, such as fruit, vegetable or grain, that the digestive system cannot break down. Because fiber stays in the digestive tract longer and absorbs water, high-fiber foods provide a feeling of fullness for a longer period of time. Fiber also helps to keep your child's digestive system healthy preventing difficulties such as constipation. Choosing a high-fiber breakfast cereal for your child keeps her tummy satisfied so her mind stays sharp. Many adults and kids fail to get the recommended amount of fiber per day. The National Institute of Medicine Food and Nutrition Board recommends that children ages 1 to 3 consume 19 g of fiber per day, and children ages 4 to 8 get 25 g of fiber per day. Any food containing 2.5 to 4.9 g of fiber is considered a good source of fiber, while those containing more than 5 g serve as an excellent source of fiber, according to the Colorado State University Extension. When choosing a cereal for your child, read the nutrition label to determine which cereal contains adequate fiber content. 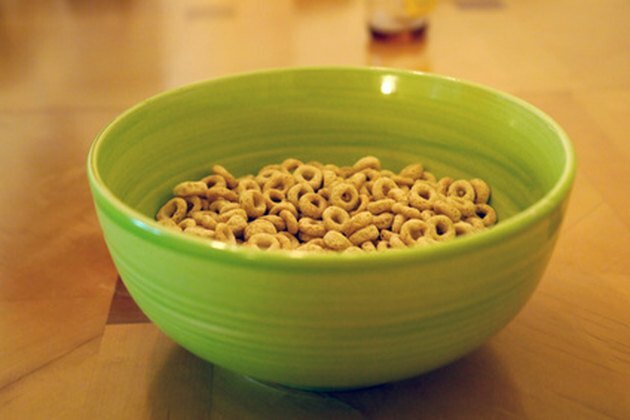 Cheerios, a cereal manufactured by General Mills, serves as a good source of fiber. The familiar yellow box contains a whole-grain oat cereal loved by kids and adults alike. A 1-cup serving provides 4 g of fiber, making up 14 percent of the recommended daily intake, according to Nutrition Resource. Available in a variety of flavors that also serve as a good source of fiber, such as whole grain, honey nut and cinnamon burst, Cheerios satisfies a kid's taste buds and a parent's desire for good nutrition. Frosted Mini-Wheats combine the nutrition of whole grain with the sweetness of a light frosted coating. Kids love the frosting, while parents love the nutrition. A 1-cup serving of Frosted Mini-Wheats contains 5 g of fiber, classifying it as an excellent source of fiber. Also available in little bites to make it easier for smaller kids to eat, Frosted Mini-Wheats contribute to a well-balanced breakfast or make a great on-the-go snack. Raisins, the sweet snack made by drying grapes, serve as a portable ready-to-eat all-natural fruit snack. Raisins contain fiber and, when added to crunchy wheat bran flakes, the combination of crunch and sweetness satisfies both kids and parents. Although available from several different manufacturers, typically, a 1-cup serving of Raisin Bran provides 7 g of fiber, making it an excellent source of fiber.